While following the development of information technology and technology itself, seems nothing is impossible at all. We even can place a cinema in our pockets. How? 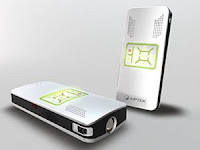 Aiptek tells us how to do it by introducing the latest in Pico projectors, the Pocket Cinema V10. It is a compact projector with built-in media player. What can the Pocket Cinema? Play Mpeg4 movies, Jpeg Photos and MP3 music files. But seems that is not all it can perform, when connected to an external device it will project movies and images from any video source with an AV out and gaming graphics. If measured the Pocket Cinema is of 125mm x 55mm x 23mm. Easily one can imagine how much convenient the product is. • Projects image up to 50” within distance from 21cm to 180cm. • Projects image from connecting to iPod, DV, DSC, game console or mobile phone (via AV-out) or from playback in embedded flash memory or SD/MMC memory card. Though who are eager to have at least one cinema in a pocket can do that only from November at Amazon.co.uk and Firebox.com at an SRP of £299.99. But that is not all as there are included in the box is ArcSoft Media Converter, ArcSoft Total Media Extreme, Li-Ion battery, AC adapter, USB cable, AV Cable (3-in-1 AV jack), Tripod, Pouch, Application CD, Quick start guide.